The first quarter of Groestlcoin has been one of the busiest quarters for the Groestlcoin developers than any other. Unlike other cryptocurrencies who fail to deliver on their roadmap promises on time, Groestlcoin is far ahead of their roadmap currently. On-Chain Atomic Swaps with Komodo (KMD) on BarterDEX and added to their exchange platform. Added to Bittylicious, creating a new way to buy directly with USD, GBP and EUR. Increased our electrum servers from already impressive 80 to 120 servers! Being added to new Korean exchange Coinbit, launching in Early April, along with an 18,000 GRS giveaway. Groestlcoin BIP39 is a tool for converting BIP39 mnemonic phrases to addresses and private keys. 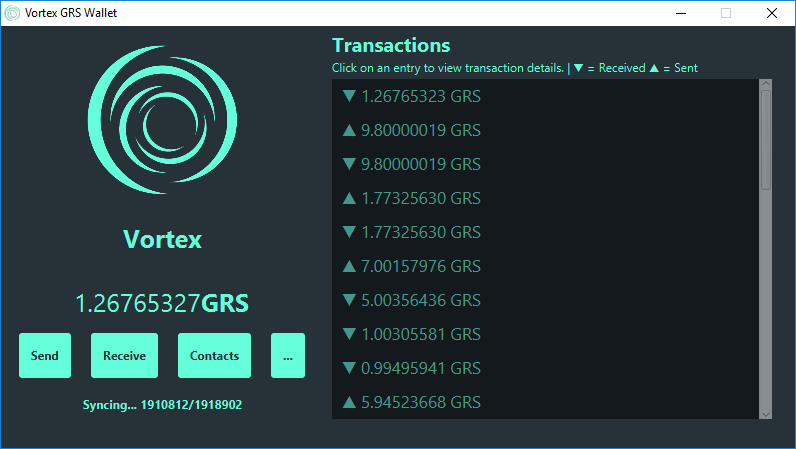 Electrum-GRS has been updated from version 2.5.4 to 3.0.6 - That's quite a jump! But as we saw with Electrum 2.7 and the vunurabilities that were found several months after release, you cannot be too careful. We are as sure as we can be that Electrum 3.0.6 is the most secure version of Electrum to date. Additionally this version brings with it BIP0032 addresses. You can now create a Segwit wallet with Electrum which will give you addresses that start with 'grs1' instead of 'F'. Please note that some exchanges and pools may not yet recognise these addresses and consider them invalid whilst they update. Along with the release comes 'Replace-By-Fee', which allows you to increase the fee of a transaction if it has not confirmed quick enough (Not an issue we currently will have with Groestlcoin but it's a nice feature! There is so much that has changed with the wallet so have a read through the release notes, upgrade and have a play! • Moved away from Linux binary file. Users must compile from source now. • Alternative coin selection policy, designed to help preserve user privacy. Enable it by setting the Coin Selection preference to Privacy. • The wallet file format has been upgraded. This upgrade is not backward compatible, which means that a wallet upgraded to the 2.7 format will not be readable by earlier versions of Electrum-GRS. Multiple accounts inside the same wallet are not supported in the new format; the Qt GUI will propose to split any wallet that has several accounts. Make sure that you have saved your seed phrase before you upgrade Electrum-GRS. • This version introduces a separation between wallets types and keystores types. 'Wallet type' defines the type of Groestlcoin contract used in the wallet, while 'keystore type' refers to the method used to store private keys. • Replace-By-Fee: RBF transactions are supported in Qt. A warning is displayed in the history for transactions that are replaceable, have unconfirmed parents, or that have very low fees. • Seed phrases can be extended with a user-chosen passphrase. The length of seed phrases is standardized to 12 words, using 132 bits of entropy. In the wizard, the type of the seed is displayed in the seed input dialog. • Add number of confirmations to request status. • In the GUI, refer to passphrase as 'seed extension'. • Wizard: Hide seed options in a popup dialog. • Wallet file encryption using ECIES: A keypair is derived from the wallet password. Once the wallet is decrypted, only the public key is retained in memory, in order to save the encrypted file. • The daemon requires wallets to be explicitly loaded before commands can use them. Wallets can be loaded using: 'electrum-grs daemon load_wallet [-w path]'. This command will require a password if the wallet is encrypted. • Invoices and contacts are stored in the wallet file and are no longer shared between wallets. Previously created invoices and contacts files may be imported from the menu. - Child Pays For Parent (CPFP) dialog in the GUI. - RBF is automatically proposed for low fee transactions. • The GUI shows a blue icon when connected using a proxy. • Multiple Chain Validation: Electrum-GRS will download and validate block headers sent by servers that may follow different branches of a fork in the Groestlcoin blockchain. Instead of a linear sequence,block headers are organized in a tree structure. Branching points are located efficiently using binary search. The purpose of MCV is to detect and handle blockchain forks that are invisible to the classical SPV model. • MultiGroestl, Groestlwallet, Simple Groestlcoin support: If the user enters a BIP39 seed, the full derivation path is configurable in the install wizard. - Network dialog uses tabs and gets updated by network events. • Daemon: The wallet password can be passed as parameter to the JSONRPC API. • The project was migrated to Python3 and Qt5. Python2 is no longer supported. If you cloned the source repository, you will need to run "python3 setup.py install" in order to install the new dependencies. - Native segwit scripts are supported using a new type of seed. The version number for segwit seeds is 0x100. The install wizard will not create segwit seeds by default; users must opt-in with the segwit option. - Native segwit scripts are represented using bech32 addresses, following BIP173. Please note that BIP173 is still in draft status, and that other wallets/websites may not support it. Thus, you should keep a non-segwit wallet in order to be able to receive groestlcoins during the transition period. If BIP173 ends up being rejected or substantially modified, your wallet may have to be restored from seed. This will not affect funds sent to bech32 addresses, and it will not affect the capacity of Electrum-GRS to spend these funds. These values are identical for mainnet and testnet; tpub/tprv prefixes are no longer used in testnet wallets. The distinction between p2sh and p2pkh in private key means that it is not possible to import a p2sh private key and associate it to a p2pkh address. • A new version of the Electrum-GRS protocol is required by the client (version 1.1). Servers using older versions of the protocol will not be displayed in the GUI. • By default, transactions are time-locked to the height of the current block. Other values of locktime may be passed using the command line. 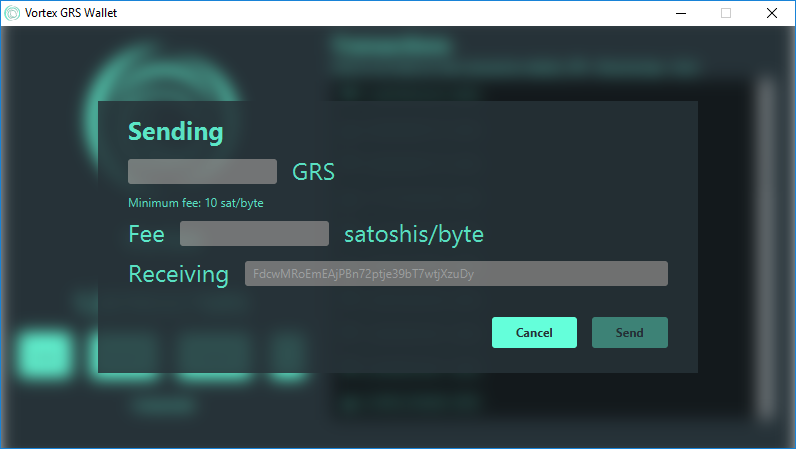 • Windows: if using the installer binary, there is now a separate shortcut for "Electrum-GRS Testnet"
• No scripts - Electrum-GRS does not download any script. A compromised server cannot send you arbitrary code and steal your groestlcoins. • No Downtimes - Electrum-GRS servers are decentralized and redundant. Your wallet is never down. • Proof Checking - Electrum-GRS Wallet verifies all the transactions in your history using SPV. To go with the Electrum 3.0.6 multi-platform desktop release, comes updates to Electrum-GRS for Android and Blackberry too. This includes BIP-0032 and BIP-0039 which allows for the using of Non-Native and Native Segwit addresses which bring with it potentially lower and faster fees (As if we need that!). You're also now able to request an amount when requesting a payment and the ability to spend your own unconfirmed 'change' from transactions. Along with that technical stuff, this update comes with a very welcome slight UI refresh and a good round of bug bustin'! Sentinel for Android and Blackberry has also been updated to v2.7.1 and brings the view-only wallet into the Segwit era. Allowing to track your Segwit wallets (paper included) all in one place. It brings more security with haptic PIN entry support and using HTTPS for the block explorers (of which there are now more than ever). A highly requested feature to be able to refresh your balances has also been included. • Open source and unlicensed. • No Private Keys - Groestlcoin Sentinel only uses Public Keys. It never knows or never asks for your Private Keys. 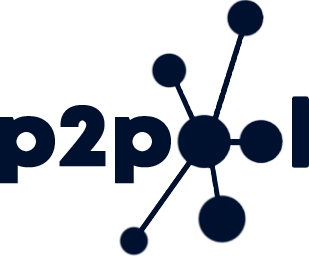 • Track multiple XPUB's, YPUB's or Addresses - Add multiple XPUB's, YPUB's or addresses to your Groestlcoin Sentinel Watchlist to keep track of balances, transactions, and accept payments into any added wallet or address. • Deterministically derives Groestlcoin Addresses - Deterministically derive new Groestlcoin addresses associated with your added wallets without needing access or knowledge to your private keys. • Shareable QR code - Create payment request QR codes with address and amount encoded directly into the image. Share with anyone or any app directly from Groestlcoin Sentinel. • Exchanges - Groestloin Sentinel can pull the current Fiat price from Cryptopia and Bittrex. • Secure PIN Code protection - Add a secure PIN code to protect access to Groestlcoin Sentinel. Optionally turn on PIN Scramble to help thwart against keylogger attacks. Our website went through an overall upgrade, new graphics and a faster loading time which match the speed of GRS transactions. The community has been hard at work with development projects this quarter, aiming to push Groestlcoininto new sectors. The community has been primarily focused on Gamers this quarter since Gaming has become a very large and tech-savvy industry it makes sense to target this market. However, there is a lot of stigma regarding cryptocurrencies with gamers, since mining has driven up the price of Graphics cards towards the end of 2017 and early 2018, the gaming community is, in a large part, quite split into the pros and cons of Cryptocurrency. We think there is some middle ground to resolve conflicts that gamers/streamers and cryptocurrency enthusiasts currently have. Streamers are facing a huge issue with Paypal donations and that of chargebacks - It makes declaring their incomes all that more complicated along with knowing just how much you're earning whilst streaming, and a whole host of other issues. The Groestlcoin community has developed a completely trust-less wallet-to-wallet donation system with the Streamlabs API. There is no third-party handling the transactions and makes the platform impossible to monetise via fees at a later date like some others are considering. Donating to streamers via a proof-of-work cryptocurrency, such as Groestlcoin, solves a lot of these existing issues. The transaction is instant and the network fees are almost zero (0,0001 $). 1. There are NO chargebacks - Like donations should be. Once you receive your cryptocurrency, they are yours and cannot be refunded/charged back. This makes ALL donations SERIOUS donations. 2. People who watch streamers historically tend to have gaming PCs with graphics cards, or high-powered processor to game themselves (With the exception of console gamers, I suppose). Also, whilst you're watching streamers play their games, you aren't likely to be using your graphics card to game. How great would it be to be able to watch your favourite streamers, whilst earning money that you can either keep or donate, without ever touching your bank account? The Groestlcoin community feels that this is a better and more secure way to earn and send cryptocurrency donations. You can mine Groestlcoin directly, or mine whatever is the most profitable for your hardware and convert it to Groestlcoin (NOTE: MiningPoolHub does this automatically if you enable it!). Vortex is a multi-platform SPV light-wallet with a simplistic, minimal design language for newcomers to Cryptocurrency as well as Veterans who like a simple and sleek design. The wallet has been carefully engineered to not be confusing. All of the bloat and complexity has been stripped out to produce a simple and fast wallet. Versioning system changed, add version title for each version too. Significant code enhancements for optimal performance, bugs squished and added the ability to change between Mainnet and Testnet. Groestlcoin is one of the only coins around that you can still solo-mine, this is THE most decentralised solution to mining, however, you can go days without any reward if you don't have enough GPUs, so it isn't practical for most. In an aid to further support and decentralise the Groestlcoin network, with the help of the developers, the community has updated the Groestlcoin P2Pool. People can now host P2Pool networks for people to mine on and can receive smaller, but more consistent rewards for mining. You can view a list of compatible pools here: http://grs-fr.catpool.io:8080 (More on that soon). P2Pool is basically a more decentralised pool. Rewards are shared among everyone who mines in the global pool whenever P2Pool finds a block. To learn how to create a node, please go here: https://groestlcoin.org/forum/index.php?topic=306.0. Hosting a node comes with the benefit of a block finder’s fee that you can set if your local pool generates a block and can be run alongside other coins P2Pools. To accompany the P2Pool relaunch, we have also updated the Node Scanner which is run alongside (or rather, on top of) the P2Pool node. This scans the network for other P2Pools and produces a list of nodes in an index.html page. Tanariel (Discord tanariel#4076) for running nodes and getting the P2Pool node scanner up and running. MadeOf_Tin (Discord Madeof_Tin#7509), Tiamo (Discord Tiamo#1675) and Steven0_0Smith (Discord Steven0_0Smith#0131) for all running nodes and reporting feedback. Also a special thanks to the owner of Suprnova for helping get P2Pool up and running on the more technical side. One more thing that has been done within this 3 months, before release, is Groestlcoin being added to the third-party multi-wallet Coinomi. As a small team, we don't take being added to third-party wallets lightly - We are fully aware that they are entirely out of our control if the wallet, for some reason, disappears. However, Coinomi is different, we have our own Electrum wallet that is fully compatible with Coinomi to recover your funds in such an event. You can now store your Groestlcoin securely on your mobile along with all your other cryptocurrencies that are supported there, this also paves the way forward to be being added to Shapeshift in the future. Note 2: There is also an issue with the Coinomi wallet that generates invalid XPUB keys (extended public keys). We have given them the solution but are waiting for them to implement the fix. Note 3: The Coinomi Wallet is no longer open-source. Use this wallet at your own risk. Wallet only needs to be backed up once, on initial creation. Wallet backup consists of a simple list of 12 common words (BIP-0039) - Compatible with our own Android Electum-GRS wallet. Private Keys never leave your device, you own your keys, always. Support for BECH32 addresses. This adds support for Non-Native and Native Segwit addresses – Tab on ‘alternative address’ to toggle between legacy (prefixed with ‘F’), non-native Segwit (prefixed with ‘3’) and Native Segwit Addresses (prefixed with ‘grs1’). Short after this release, Groestlcoin (GRS) will be listed on new exchanges. We can't impose a specific release date to exchanges, but we assure you that GRS community will be happy.